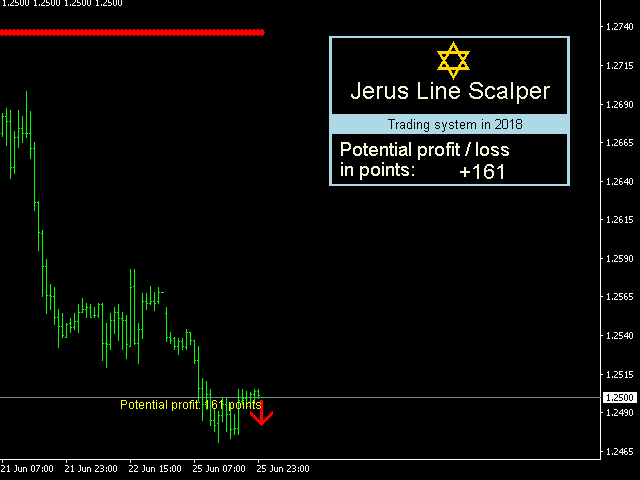 Jerus Line Scalper is an indicator for scalping on EURUSD, GBPUSD, AUDUSD, USDJPY and USDCAD pairs. Recommended pairs: M5, M15, M30 and H1. The trading strategy is as follows: as soon as the arrow appears, open an order in the direction of the arrow and set take profit to +10 points. Set stop loss at the indicator's stop line. Stop line is displayed in red or blue depending on the indicator signal. Also, the Martingale system can be applied in the system. If a trade is closed at a loss, the next one is opened with a doubled volume. The indicator is a full-fledged trading system that we created and tested in real time. It is suitable for both novice traders who do not yet have their own trading system, and for experienced professionals. The system is completely autonomous and requires no additional filters or signals. As can be seen from the description above, it is very easy to use it. No additional knowledge is required. Jerus Line Scalper operation principle. The indicator defines the current price direction by several price periods using 17 market analysis algorithms. After that, the indicator provides a recommendation on a trade direction. The indicator draws a stop line on the chart after examining the price movement amplitude. This stop line is used to set an order stop loss. 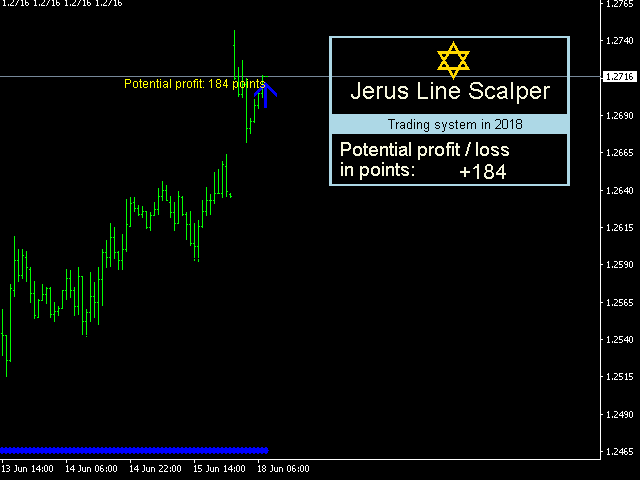 Jerus Line Scalper is a fully autonomous trading system that requires no extra indicators for trading. 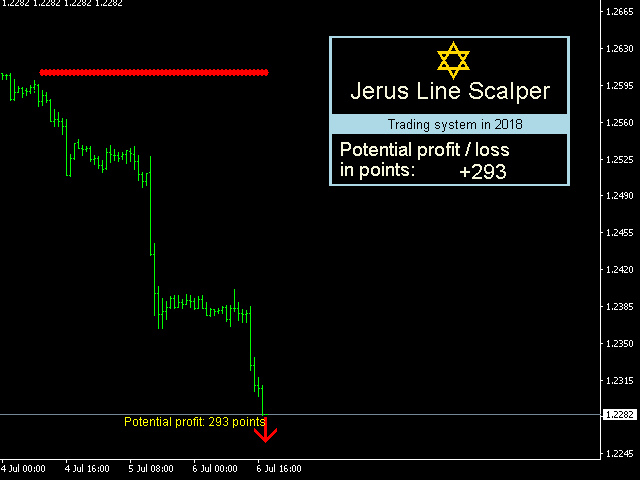 Jerus Line Scalper does not re-draw its signals. 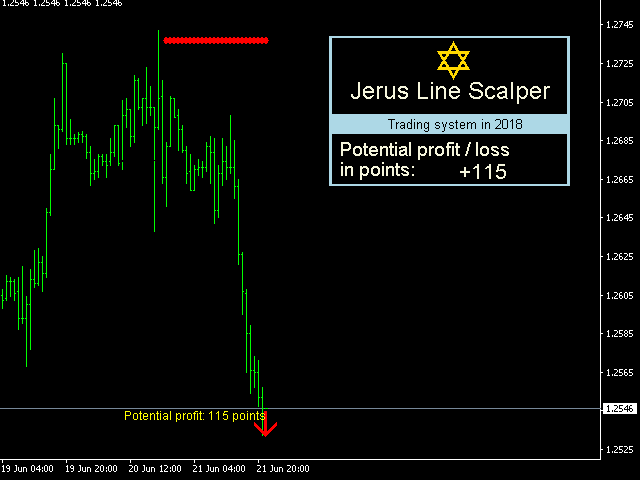 Jerus Line Scalper works on all currency pairs and timeframes. However, there are recommended timeframes and currency pairs. These are the ones we have tested in trading. inform - display the info panel on the screen. Color - info panel color. Longitude - number of time series elements for analyzing a trend direction. ATRperiod - Average True Range period. Ratio - stop line calculation ratio. Shift - initial bar index for searching the maximum or minimum price value for a certain time period. Signal - enable/disable push and email notifications.